April 1941. "Chicago. Lunch wagon for Negroes." 35mm negative by Edwin Rosskam for the Resettlement Administration. View full size. Submitted by Zcarstvnz on Sat, 06/01/2013 - 6:23pm. The 1932 Chevrolet is a Standard Series 5-passenger Coupe. Just 7,566 were made in both Standard and Deluxe series'. It has the Deluxe Series chrome hood ports which was an available option along with an accessory Chevrolet Eagle hood ornament. Deluxe models also had dual side mounts (with covers optional), dual horns, dual windshield wipers, and dual cowl lights. In the Standard Series the 5-passenger couple cost $575 and weighed 2,700 pounds. The 2-door coach looked similar, but it had a much larger rear side windows. Submitted by SteveLexington on Mon, 05/13/2013 - 6:43pm. Not to beat a dead horse, but it's a gasoline bus. I'll go a step further and say that it's almost certainly a Yellow Coach (GM) Model Y parlor coach of 1928-1929 vintage, designed for intercity service This particular example is a high-headroom model with raised roofline; the slightly lower section at rear was the location of a small baggage rack, the remains of which were mistaken for trolley pole hooks by a previous commenter. Other photos in the same LoC series show that the diner's owner didn't bother to cover the wheel well on the left side of the bus. Submitted by Jonathan Morse on Mon, 05/13/2013 - 3:22am. This image is one of a set of five at the Library of Congress. Other shots show the trolley's hold-downs on the roof and also show that the small cylinder at the rear of the car is for the trolley cable. Submitted by Lectrogeek68 on Sun, 05/12/2013 - 10:16pm. Not only the wheel cutout, but the lack of front-to-rear symmetry give it away. Streetcars, on most lines, are not capable of making u-turns, so front must double as rear. 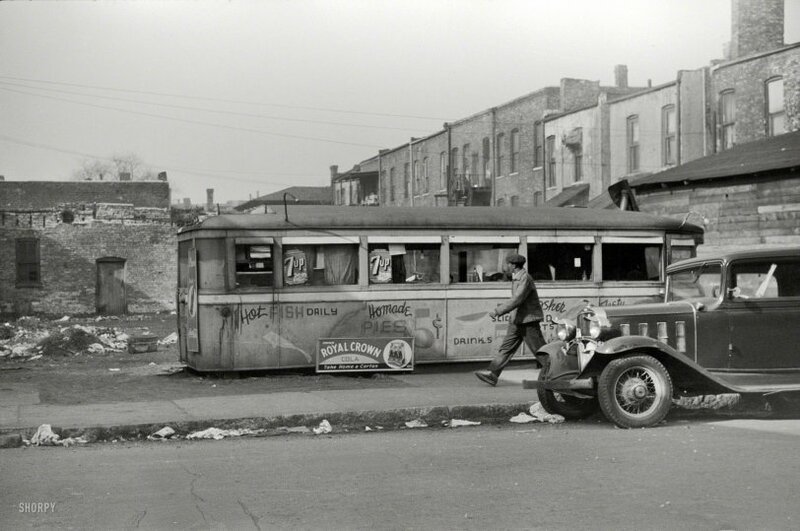 A single taillight would have been legal for most motor vehicles well into the '50s, and for this bus to be surplussed in 1941, it would have had to be from the '20s or so. Submitted by Jonathan Morse on Sun, 05/12/2013 - 5:52pm. I'd guess that the word "kosher" here means only that the red hot is made with a beef hot dog rather than a pork hot dog. Submitted by jimboylan on Sun, 05/12/2013 - 5:02pm. It must have been a rubber tired vehicle. The cutout for the rear tire, above the Royal Crown Cola sign, has been plated over and painted. The molding to the Left of the word Homemade wasn't extended down over the new material. Submitted by aenthal on Sun, 05/12/2013 - 10:41am. The roofline, with its rear step element, and the single tail light, and the lack of any cut outs that would let one change a tire, suggest to me, that this vehicle was a retired streetcar rather than a railroad train car, or former bus. Submitted by jwp on Sat, 05/11/2013 - 10:49pm. The 1932 Chevrolet - can anybody identify the model? Submitted by Harvey in Fla on Sat, 05/11/2013 - 8:55pm. That 1932(?) Chevy is tricked out with chrome/nickel plated hood vents, eye lids, and headlight bar - quite spiffy. Submitted by Carey on Sat, 05/11/2013 - 4:27pm. Does it really say "kosher" or could it be something else? I can't think of what else it might be ending in "osher." And if it does say "kosher," I wonder what Kosher foods they might offer. Submitted by Peter on Sat, 05/11/2013 - 3:37pm. It's hard to be sure as the sign's partially obscured, but it looks like this "lunch wagon for Negroes" is offering Kosher hot dogs. Submitted by Horace T. Water on Sat, 05/11/2013 - 3:05pm. Submitted by SteveLexington on Sat, 05/11/2013 - 2:48pm. Many a streetcar or railroad coach were converted to diners after their passenger-carrying days were over. But this is the first example I've seen of a bus making the transition. It must have been a very cramped dining experience. Submitted by cruxsaddle on Sat, 05/11/2013 - 1:39pm. Quite a ritzy automobile! Anyone know off-hand what it is? I'd hate to have to do searches on hood ornaments.